Pay Per Click Advertising is not unlike a horse race. Just like the racehorses that take home the trophy, the best Pay Per Click Advertising firms need to be in good form, well trained, experienced, with many races under their belt, and aren’t scared off by the advertising competition. Our 60 day risk-free trial should be a sign that we have a great service to offer. We aren’t aware of anyone else in the industry does this. That’s how confident we are in our services that we are willing to risk working for free for two months to prove we can make a difference. When it comes to choosing the best Pay Per Click Advertising firm, you want someone who is always one step ahead of the rest, and prepared to help you with your advertising needs. The best Pay Per Click Advertising firms need to be able to adjust to clients that are continually on the go. Whether you are physically located elsewhere or your advertising campaign is, Webrageous Studios can help. Webrageous understands that Pay Per Click Advertising is a race, and just like in a race, it needs to be one step ahead of the rest if it is going to win you the money. Webrageous Studios has been assisting various businesses with Pay Per Click Advertising for more than five years. 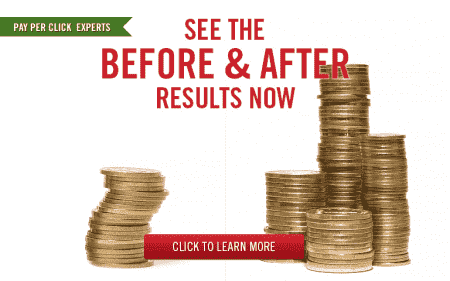 The firm has helped turn unknown companies into some of the best online advertising sellers. Webrageous Studios can help clients with their Pay Per Click advertising on Google, Yahoo and Bing. The firm also has a clean record with the Better Business Bureau (BBB). The firm offers A/B testing of advertisement text and landing pages to optimize quality scores. With more than six years’ experience as a web design firm, Webrageous Studios is one of the best Pay Per Click Advertising firms in helping optimize your landing pages and can create and design websites for its clients. This is a factor that can often be overlooked by other Pay Per Click Advertising firms. Webrageous Studios also offers Pay Per Click Advertising experts that are bilingual in English and Spanish to help clients wanting to run advertising campaigns in Spanish. Webrageous Studios has some of the best Pay Per Click Advertising consultants and employees located all over the world so we can adjust to your schedule according to where you are in the world at any particular time. If you need an improvement on your advertising campaign that is going to take all night to complete, we have someone around the world that can help get the job done. The firm is also an expert in fraud management and is able to dispute any fraudulent activity that might arise on your Pay Per Click Advertising accounts across Google, Yahoo and Bing. While Pay Per Click Advertising has the ability to turn unknown companies into selling machines, it is also affecting some websites with high customer acquisition costs and online click fraud. By outsourcing management of Pay Per Click advertising campaigns to the best Pay Per Click firms like Webrageous Studios, you will start to see an increase in your average cost per click. Webrageous Studios also ensures that it knows everything about your business, your advertising goals and your budget to be absolutely certain that it is able to properly track your Pay Per Click Advertising campaigns. The firm can then focus on optimization techniques throughout your Pay Per Click Advertising campaigns such as campaign structure, geographical targeting, advertisement text, landing pages and conversion statistics. In 2008, Webrageous Studios was named among the Top 10 Best Pay Per Click Management Firms worldwide by TopSEOs. Since receiving this honor, Webrageous has continued to live up to its name, providing top quality Pay Per Click Advertising services to its clients. Webrageous Studios’ flawless reputation in providing quality Pay Per Click advertising services has also earned it a special relationship with Google which allows the firm direct phone support to Google. Webrageous’ Pay Per Click Advertising account managers are all qualified in Google AdWords. The firm is also a qualified Microsoft adExcellence (Bing) member. If you want to drive traffic by qualified customers to your website from Google, Yahoo and Bing through Pay Per Click Advertising, then choose one of the best firms in the business – Pay Per Click Advertising Management Expert, Webrageous Studios.